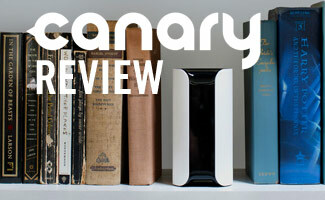 Canary Home Security Review: The Next Big Thing in Home Security? Installing a home security system used to mean signing a contract with an alarm company, a big installation nightmare and paying monthly fees. Canary is aiming to disrupt the security industry with its sleek, all-in-one device. This makes Canary a great stepping stone to a top home security system. Can the equipment really perform well? We’ll dig deeper to find how the Canary alarm systems perform and whether you can depend on it solely as your main form of home security in our Canary security review. Is Canary A Good Solution For You? Canary products are generally discounted from MSRP on Amazon. We’re not quite sure how we feel about Canary. We’ve found many reviews of customers being displeased with its performance, but as of recently more and more are happy with Canary. It seems like Canary is making the updates that users want to see. Read below to get the good and the bad. How Does Canary Flex Work? See how the Canary Flex works and if it’s a good option for your home. Honestly, we can’t say either way. It appears that the Canary security system is improving daily, but we see that there are still some quirks that need to be worked out. The device does have a 1-year warranty and 60-day money back guarantee, so if you are unsure about it you could purchase it and test it out yourself. If you find that you’re happy — great! If not, you can always return it within those 60 days. If you are curious about the leading Canary competitors, read our review of the DIY security systems. What are your thoughts on Canary? Does the Canary security system detect pets? I have a 52lb yellow lab mix and am wondering if she will inadvertently set off the alarm. Yes, the Canary system detects pets, so your dog would trigger the motion sensor. How many megapixesl is the camera? At what distance with it activate the motion sensor and does it works with sim card or wi-fi? Canary is 3.1 megapixels and is connected via WiFi. We can’t find any information regarding motion detection distance. However, I have a Canary and it detects motion from at least 25 feet away. In my personal opinion there are much better solutions out there like iSmartAlarm or Arlo that will alert you of a security threat before it reaches the interior of your home. Since this is detailing an indoor solution I would recommend iSmartAlarm instead of Canary since their Cameras connect with the same CubeOne Hub that their door and window sensors connect to. This way if someone tries to come through a front door or window you are alerted the moment it takes place and your cameras (recording upon event — once the contact sensor(s) is triggered) record the whole thing on tape. So cool! Canary has a beautiful design but just leaves me feeling a little uneasy that it only begins working and capturing footage once someone is already inside of my home. I tend to lean towards wanting to know the moment someone is breaching my home to give me a little more time to react and call the authorities. I just got iSmartAlarm’s iCamera KEEP and really like that it has a pan & tilt motorized base & digital zoom so I can see what’s going on at home while I am away with the HD streaming quality picture on my smartphone. I can even see what is going on at night with the night vision when the cats seem to take on a different personality. I strongly encourage the readers to look at both Canary and iSmartAlarm when it comes to an indoor camera solution. I am a definite believer in iSmartAlarm’s iCamera KEEP and feel like for all the features it has it is really a steal of a deal at $150. I love Canary, sleek design and great quality video too! Only downside is it’s indoor only but hopefully they’ll come out with an outdoor version soon!